Clean and comfortable. Convenient location. Immaculately presented and the beds were very comfortable. Our whole family loved staying at this cottage and we would definitely stay again. Well equipped, clean and convenient. We thought it was lovely and an ideal location for the coast and visiting family in Kings Lynn. Very pleased with the cottage, very comfortable, is convenient for eldery family (who I thought might stay over but they didn't) and North Norfolk Coast. We enjoyed a very comfortable stay, lovely clean and stylish cottage, everything we needed had been thought about. Thank you for the lovely Christmas decorations which were a great addition and helped us to feel Christmasy! Thank you also for the biscuits and Champagne. Very comfortable, enjoyable stay in a very well equipped cottage. Beautifully kept, can't think of anything they have forgotten to supply. We have visited North Norfolk over a number of years and this is certainly one of the most comfortable holiday lets we have stayed in!!!!! We really appreciated the quality mattresses and plentiful equipment. The cottage was also extremely clean. The Jigsaw fitted perfectly! Much better weather than anticipated. Holme Dunes, a wonderful beach discovery, great food at the William IV, Sedgeford, most acceptable fish and chips just down the road, and a base that could not be bettered - Compact, comfortable and beautifully appointed, it had all we wanted and we enjoyed every minute at 1 King William! Also thank you for your welcome gift which went down really well!!! Thank s also to Sowerby's for being pleasant and competent. Another amazing week in this lovely cottage, the weather has been perfect for sea and sand, fantastic temperatures! We've had great success crabbing at Brancaster Staithe and Wells, all crabs safely returned to the sea! Many thanks for the wine. Another hugely enjoyable week in this superb cottage. Good Birdwatching at Tichwell and coastal walks at Wells and Morston. Docking is wonderfully positioned to explore North Norfolk. Thank you, we have enjoyed our stay in your lovely cottage. We were blessed with good weather too, so enjoyed time in the garden. We enjoyed meals at the Jolly Sailors in Brancaster Staithe and the local 'chippy' was good too. Again Thank you a good place to celebrate our 3 score and ten birthdays. Will recommend this lovely spot to all our friends. Enjoyed another week in Norfolk at this ideal location. The cottage has everything you could ask for. We particularly liked Norwich and Cambridge and highly recommend a boat trip from Morston Quay to see the seals at Blakeney Point. This is our first visit to your cottage and we have enjoyed staying here. Clean, well organised and comfortable - just what we wanted for a relaxing post Christmas/NYE. The welcome gifts were much appreciated and delicious. we loved the wood burning stove and enjoyed cosy nights in when the temperature dropped. Holkham beach and woods were great for shifting some Xmas pounds - though the delicious fish and chips from French's in Wells cancelled it out! Thanks for all the usefull thinkgs in the kitchen that we had inevitably forgotten to bring with us! Enjoyed our week staying in a very clean and comfortable and spacious cottage. 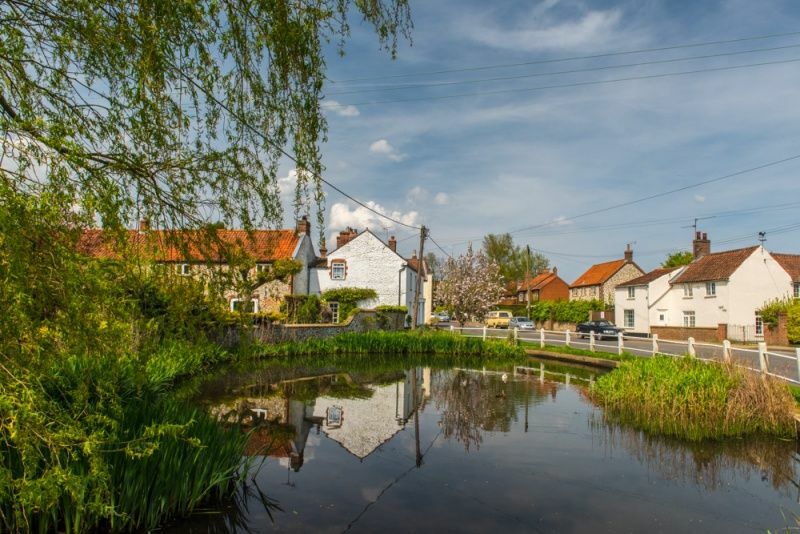 Docking is a delightful village and several roads seem to meet here which makes it easy to visit the may places of interest in the area. This was our first taste of Norfolk and we much enjoyed our stay. Its been really, really, really, really good. Jack 4 and 3/4 years. Great holiday in your comfortable house! Our third stay in your lovely cottage. We've had a great week despite the mixed weather. We'll be back!! This property is very clean and homely. Wonderful week - lovely well equipped accomodation and beautiful weather. North Norfolk is a delightful area to visit and the sunshine highlighted its' loveliness. Excellent accomodation offering all facilities - would certainly return. Great location for visiting North Norfolk. This is our 3rd visit to your excellent cottage. We have had an enjoyable week. Good cycling and great food in the many pubs in the area. First time in this holiday cottage. Excellent and very comfortable accomodation, everything we could have asked for, beautiful and clean. Docking is a pretty village and ideally located. Our second visit to this lovely holiday cottage. Everything is first class. Docking is a very good locationfor visiting this part of Norfolk. We have had a brilliant holiday staying in this fabulous cottage. North Norfolk is a very beautiful place. The cottage was very comfortable and had everything we needed for a great stay. Lots to see and do in Norfolk. A lovely week in this clean, comfortable and very well appointed cottage. Docking is a lovely village. Don't miss the Wednesday morning market at Ripper Hall! Lovely cottage. Had a great time in Norfolk. Good fish & chip shop in the village. Really grat and comfortable, homely cottage. Thanks for a lovely stay. We really enjoyed the local attractions and cafes. The farm shop cafe at North Creake was a good option for early evening tea and the Jolly Sailor was very family-friendly with tasty pizzas! Lovely place to stay, very clean! We have thoroughly enjoyed our stay here - thank you! Our second visit to this wonderful cottage! We've had a super holiday with exceptional weather. We made our annual trips to Bewilderwood and Dino World. The children had a brilliant tme at both venues ... highly recommended for both children and adults! The cottage still looks brand new, a real pleasure to stay here and definitely will come for our "three generation" annual holiday next year! Have had a lovely week - weather perfect. House is well appointed and equipped and have enjoyed being in Norfolk staying in Docking. Well placed village for exploring. All in all a great week. Very good week cycling. Very nice clean place with all mod cons. Hope to be back next June. Thanks. A very welcoming, clean, tidy and well located cottage. Pensthorpe was a wonderful place and excellent play area for kids too. Great trip to Blakeney, Cley and Salthouse. Nice food at the Dun Cow, The Jolly Sailor at Brancaster Staithe and a superb meal at the Rose & Crown in Snettisham. Also, further afield, the gardens at East Ruston were amazing. Great stay had by all. Our second visit to King William Cottages! Another super trip which has confirmed our view that Docking is the ideal base for our holidays up here. Great weather meant days on the beaches at Wells, Holkham and Brancaster! Fantastic meal at The Duck Inn at Stanhoe and obviously French's fish & chips in Wells. The girls loved the excellent playground at Pensthorpe. We'll be back again next year! A few days away in the winter in your comfortable, cosy cottage. Nice to snuggle up on cold dark nights. Home form home! Well equipped, thanks for a lovely relaxing stay! A beautiful and superbly equipped cottage in an ideal central location. Highlights of holiday - kite flying on Brancaster beach and a boat trip on the Broads. A brilliant holiday with great weather. A real home from home! This cottage has everything a family could need. This is our first visit to Norfolk and will definitely not be our last, we are truly smitten. So much to do we&apos;ll have to come back next year! Having spent many holidays in Norfolk over the last few years I have to say that this has been the best cottage we have stayed in. Super location and more importantly a superb cottage with everything you could wish for! We&apos;ve had a fantastic holiday this year, thank you. Super cottage so beautifully equipped, clean and fresh. We felt at home immediately. Certainly come again and recommend the cottage to our friends. This is our first visit and wow! What a surprise awaits when you open the door. A beautiful idyllic cottage to base a week from. Close enough to explore all the hidden delights of the north Norfolk coast but far enough away to retreat in peace. During a brisk weather week it&apos;s comforting knowing you are returning to such quality and warmth. The highest of recommendations! We have had the best holiday in your gorgeous home! So cosy and well equipped. Nobody wanted to leave. What an amazing job you have done! Also spotless! Wow, what can we say, the cottage is beautiful. We have found Norfolk to be lovely with lots of nice beaches. Will recommend the cottage to all friends, better than home from home, we hope that everybody appreciates it, like we did. Thank you for allowing us to be the first guests in your lovely holiday home. We hope to see you soon!